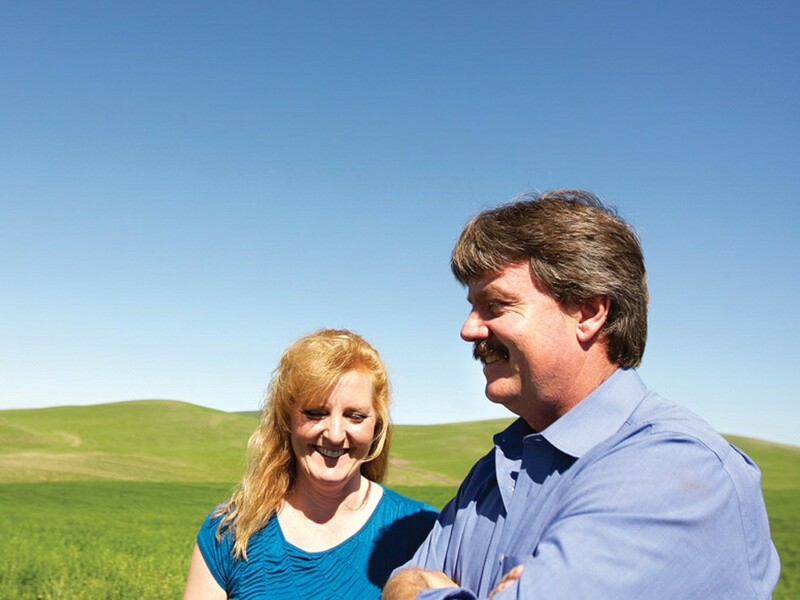 Ken and Karen Hanson will have the Palouse Wind Project on their property. do.”Four years and one unrelenting property owner later, the Palouse Wind Project is finally underway. Wind turbines won’t go up until next summer, but workers broke ground Monday, preparing roads and foundations for maintenance buildings, says Ben Fairbanks, regional director of business development for the project. Fairbanks says First Wind will spend about $10 million — all with local companies — preparing the site before winter hits. The company has partnered with the contracting firm RMT to find excavation, gravel and fencing companies within Washington to do the work. The project will include as many as 65 turbines between Highway 195 and the town of Oakesdale, Wash., 35 miles south of Spokane. Avista plans to buy the energy, which is estimated to power about 30,000 homes. One resident still fighting the project, Roger Whitten, finally settled with First Wind on Monday, selling his house and property to the company for $350,000, according to county records. Whitten claimed that industrial wind turbines close to residences would harm human health and destroy his property value. In the four years since the project was introduced, Whitten has filed appeals each time the county issued a new permit. The chief of the Spokane Police Department has apologized to a gay man who claims he was the victim of a hate crime and has pledged to change the way the department handles allegations of such crimes. “She is sorry that he felt police didn’t respond appropriately. She is sorry that he was the victim of an assault. She is sorry that he felt [the department’s spokespeople] didn’t represent his side of the story more fairly,” police spokeswoman Jennifer DeRuwe wrote in an email about the apology from Police Chief Anne Kirkpatrick. DeRuwe says the Police Department will now send a sergeant out to any incidents that are suspected of being hate crimes. The sergeant will review the case to ensure it is being investigated properly. However, no charges will be filed in the assault case of Danny Hawkins, whom Kirkpatrick apologized to. And the police are not investigating Hawkins’ assault as a hate crime, DeRuwe says. “The chief ... did read through the reports about this particular case and agrees that we don’t have enough probable cause to recommend a charging decision under the malicious harassment statute,” DeRuwe says. Hawkins says he was assaulted after leaving Dempsey’s Brass Rail in downtown Spokane early last week by a man who asked him if he was gay before knocking him over and punching him in the face.